As a 3-Line roller, the DNS Classic 3-Line is embedded with 75 individual needles, offering the basic necessity for performing the micro needling treatment. Its ergonomic handle design also optimizes the pressure applied, improving the overall achievable result. The simple and elegantly designed DNS Classic 3-Line Roller is one of the original Derma Needling System introduced by bioGenesis London. 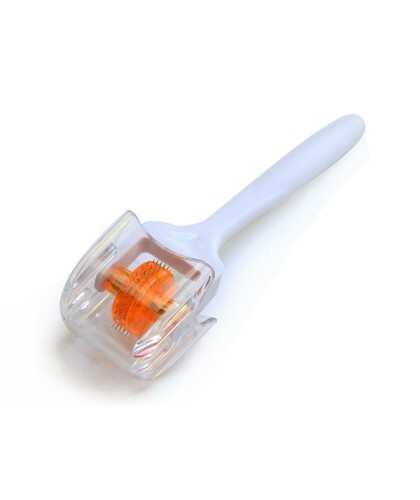 This simple roller is a commonly used tool for performing the micro needling therapy, especially over delicate areas where it is difficult to work with using the traditional 8-Line rollers. Its refined needles are smaller in radius and sharper at the tip, allowing more accurate and refined punctures that enhances the result of the treatment. 1. Sterilize the roller and other treatment accessories. 2. Cleanse the treatment area thoroughly. 3. Apply serum/lotion/cream to the treatment area (purchased separately). 4. Move the roller across the treatment area in all directions. 5. The whole process should not require more then 10 - 15 minutes. 6. Rinse off the residual serum/lotion/cream using fresh water. 7. Apply a cooling mask such as CO2 Gel mask for optimal treatment effect. 8. Disinfect the roller again before storage.